"The fact that we speak is a gift from God; whether we use this gift for good or evil is our choice." I read Pelagius' comment, and I thought, "Sure, that makes sense. Most Christians would agree with that statement." ...and uses this verse as "proof" that we have no choice in the words we speak -- God gives us our words. Of course, in the original context of these verses, Jesus was speaking to His disciples about not being worried about what to say when they were arrested and dragged into court on account of Jesus. To stretch this verse to say that all of our words are ordained by God is a bit much. Interesting, eh? 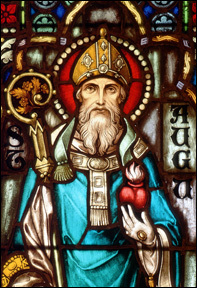 That St. Augustine, Bishop of Hippo, regarded as one of the greatest theologians of the Patristic period of the Church, took a verse out of context in an attempt to prove his point. George Mercado used to say every now and then "Feet of clay, man, we all got feet of clay." Even at our best, we're only human. We make mistakes. We let agendas cloud our interpretation of Scripture. We say dumb things as if they're foundational truths. Bob Wilson, who was the senior pastor of our church when George was the youth pastor, often said "If you think it can't happen to you, you're halfway there already." Feet of clay, man, we all got feet of clay. Yesterday I had the opportunity to lead worship during chapel -- they had devoted the whole time slot to "praise and worship". I had been recruited to do it a few days earlier by the Co-ordinator Of Such Things, who'd heard "somewhere" that I was involved in worship. She also found a couple of other people who I'd never met, and we became the day's worship team. Acoustic guitars and four voices -- nothing elaborate. The Seminary chapel doesn't even have a sound system, so it's a good thing I have "street performer" in my background -- I'm loud although not necessarily polished-sounding. At the beginning of the chapel, I told those gathered that they reminded me of junior high students -- they're all generally passionate about God, but when they sit next to each other in a group setting, everyone's too afraid of what someone else might think, so they all play it safe. They all laughed, and I think it helped to loosen people up. They spread out from each other a bit, and I saw much more diversity in expression than I've seen to date during worship at the seminary. We had a fantastic time singing to the Lord for the next half hour. Some were kneeling, others raising their hands, still others singing boisterously with their hands in their pockets -- quite a mix of backgrounds and expressions! My favourite encouraging comment after it was over came from one of the Nigerian brothers, who shook my hand, thanked me, and said, "I think this is what God created you to do." That's the kind of comment that makes you feel very small (cuz you know it's ultimately God's thing, not ours), very encouraged (that you were able to lead others to worship God), and very grateful (that God would use a boogerhead like me). Now, back to the mundanity of homework -- as I try to do schoolwork as "unto the Lord", too. "You're the guy that got me thinking differently about holding onto these "labels". Why do you hold onto the label of "Vineyardite"? You talk openly about being "vineyard" at heart and in your values. I'm not sure I understand why groups need to pull out a list of values of the kingdom and make a secondary identity out of it. Is it "Vineyard" to love to worship and feed the poor, or is it Christian? Is it Pentecostal to speak in tongues, or is it just a gift of Grace? By finding identity in being "Vineyard", is that any different than what I was doing with the label of "Gen X"? DA-A-ANG!!. You're completely right. 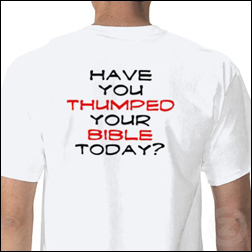 I missed the log in my own eye (Matthew 7:3-5). Thank you for pointing it out to me, and especially thank you for the gracious way that you did it. It also got me thinking more on "labels" -- generational or denominational -- and I think the reason that we tend to like them is because we're all looking for a "brand identity" that says that we're the cutting edge, or the artistic elite, or the radical passionate worshippers (implying that others aren't, right?). It's all about pride, if you want to put it baldly. 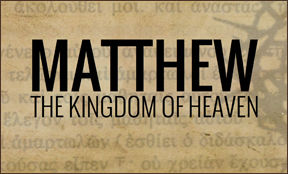 What is biblical and consistent with Kingdom theology? What is righteous and ethical? What facilitates the Vineyard mission of church planting, evangelism and renewal? 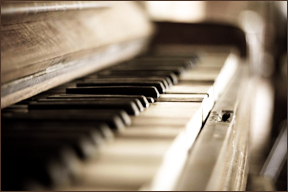 What is in harmony with our values, priorities and practices? While we don't currently attend a Vineyard church, our history with that movement is something I value and thank God for. But ultimately, Vineyard was only the seasonal vehicle that God used to teach us and give us a place for ministry -- Jesus was the one doing the changing, the challenging, and the transforming. Thanks for the reminder! The point of the exercise was to get inside Matthew's head and discern what the Spirit was motivating him to write, and what that might say to us. I read it (the first time, anyway) and what stuck out -- while valid -- was partly from my own grid (agenda?) of leadership models. So in a sense, I was reading Matthew through agenda-coloured glasses, not letting the Holy Spirit "read" me through the Gospel according to St. Matthew. Although even recognizing that I did it, is something that I think the Spirit is showing me -- I'm looking forward to the successive reads (we're only allowed one read per week) to see how less of me is in the mix and more of what the Spirit is trying to say to me comes clearer. A prophetic type prayed over me once, about eight years or so ago, that "you've never liked 'religiosity', and the Lord say that in the future, you'll dislike it even more". At the time, I thought that if I disliked legalism and religiosity any more, I'd become homicidal. But in the years since, I've discovered he was right. When I was younger, I despised legalism & control (which are really the same thing) because I was fed up with people trying to manipulate me with it, but now I hate it even more because I am fed up with seeing what it is doing to others. NOW the test is to find a loving way to respond to it, so that I don't become just like the thing I'm against! As U2 sang, "You become the monster, so the monster doesn't get you." Gotta learn more about "sowing in the opposite spirit"! Must be fall. All the neighbourhood kids are back at school, and yesterday I enrolled not-quite-full-time at Providence Theological Seminary. Yes, that's right, I've gone back to the same school I did my bachelor's degree at (although it was known as Winnipeg Bible College waaay back in ancient times like the 1980s), and I'm taking courses once again. One of which is Pre-Reformation Christian Thought, which I'm really looking forward to. If you HAVEN'T read The Celtic Way of Evangelism, repent. It's got all the things that make a great book: good research, practical and en-visionating ideas, and it's a readable length (meaning: short). Anyway, that book has whetted my appetite for more study on ancient Christianity. Plus, a friend of mine from the Vineyard in Portage La Prairie is going to be in my class, which will make it more fun. I've been "conditionally accepted" to do a Doctorate degree in postmodern ministry models at Leonard Sweet's school, but I have to upgrade a few deficiencies in my original Master's degree, which is why I'm at Prov again. Life just took (yet another) interesting turn! Man, textbooks are waaaay over-priced!